Happy Wednesday everyone! We are mid week on Spring Break #2 at our house. 3 kids in 3 different schools = 3 separate Spring Breaks and let me tell you.. productivity is at an all time LOW around here. You should all be very impressed that this post is even happening right now. I sure am. ;) I’ve actually been loving some time with each of my kids home and it has felt like summer thanks to some surprisingly hot weather the past 2 days. Makes me excited for things to come! The sunshine and warm temps inspired a little porch re-fresh! I cleaned and swept my porch and then found the cutest new outdoor rug. I still love my black and white striped rug but was ready for a change. I found this cute rug on Amazon and it’s plastic! I was a little skeptical ordering it, but was so happy when it arrived! Really nice quality and it will be so easy to keep clean. I added my hello mat and knew I needed a pop of yellow flowers. I looked all over for the perfect flowers and after not finding what I wanted I decided I would go to the nursery and then plant some in pots myself. Two days later I was shopping for groceries and these pretty yellow plants were in front of my local grocery store! In pots and everything. SCORE. Another fun score? This Daisy Cotton Shirtdress. So cute for Spring! I’m in love and it was just marked 40% off! I got this cute Promenade dress from Anthropologie and it looks like the green is sold out, but it also comes in a pretty blue! So comfortable and green is one of my favorite colors to wear every Spring. These Orchid Earrings I mentioned in my Floral Favorites post are so good you guys! I’m in love! They are lightweight and so pretty. The perfect pop of pink with almost every outfit! While we’re talking green dresses from Anthro.. this Nova Knit Dress is another long time favorite dress of mine that’s back in stock! Comfy and casual.. and green. I’m nothing if not predictable. :) I love pulling this out every Spring. 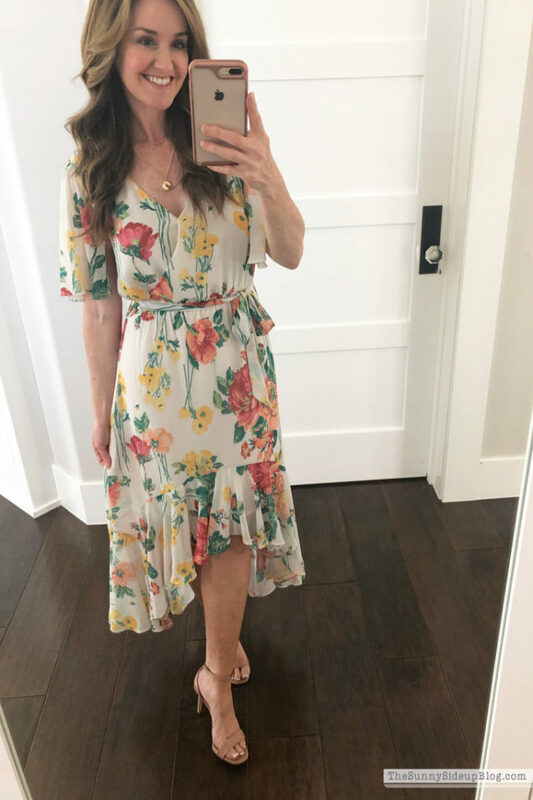 Another fun dress I’m loving that I also shared earlier in my Floral Favorites post is this Flutter Sleeve Dress. This dress is a little out of my comfort zone because I tend to gravitate toward solid colors, but I just love how feminine and pretty it is for this time of year! Sorry the lighting is so bad! I was wearing it to an evening event when I snapped these 2 pics. I love the way it’s short in the front and long in the back.. really slimming from the side too! 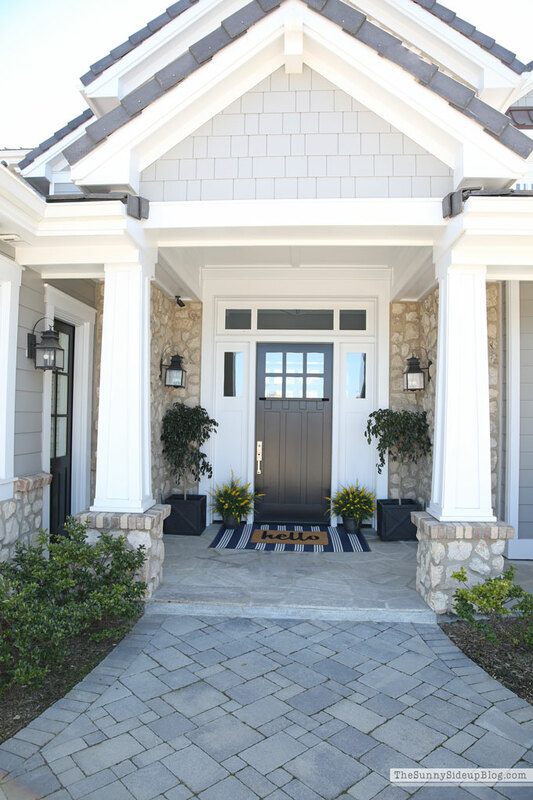 Nothing like a new dress and a new front porch rug to welcome Spring is there!? ..loving every one of these! .. also loving pink/gold earrings and layered necklaces these days! Looks so wonderful! By chance, do you recall what the name of the pretty yellow plants is? Thank you so much Vanessa! I saved the little tag to know how much to water them and now I can’t find it! So sorry. If I find the name I’ll write you back with it! Love the dress with the pretty puffed sleeves! And I love that you mention that it runs long on you because then I know I might have a chance of it not being too short on me. Haha! Great find on the yellow flowers! They’re perfect! Love the dress from Anthropologie! Too bad they’re out of my size though. Oh bummer Debbie! Check out their website..they have so many cute dresses this Spring! Over thirty years ago, our whole province (over 5 million people) went to a standard school year calendar including Christmas holidays and spring breaks. So much better for families and for planning. I loved it as a teacher who worked in a different district than the one my kids attended. The downfall was that the costs skyrocket for that week!! I love this floral dress and will be ordering it for my daughter’s graduation!! Thank you!! And the rugs just got added to my cart !! Always love your posts! So fun, Erin!! That kelly green is my absolute favorite color! The dresses are beautiful and look great on you. 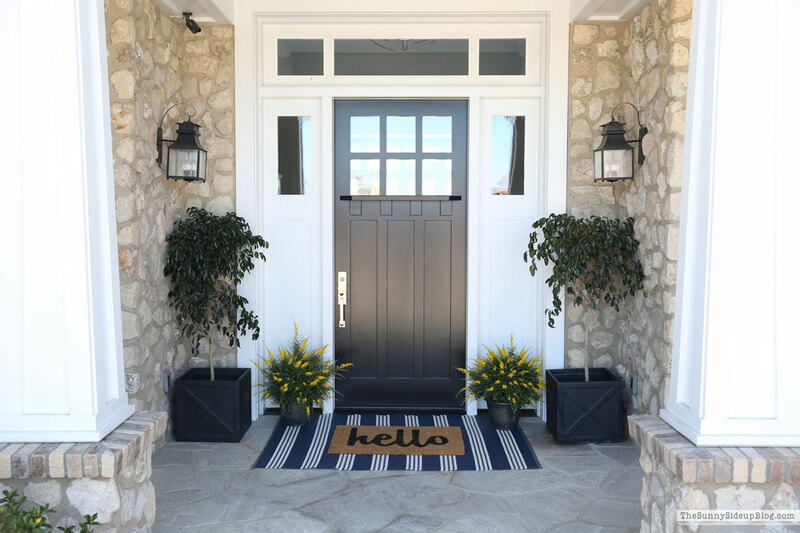 Love the porch update too! You have such a good eye for what coordinates well. Happy Friday!! 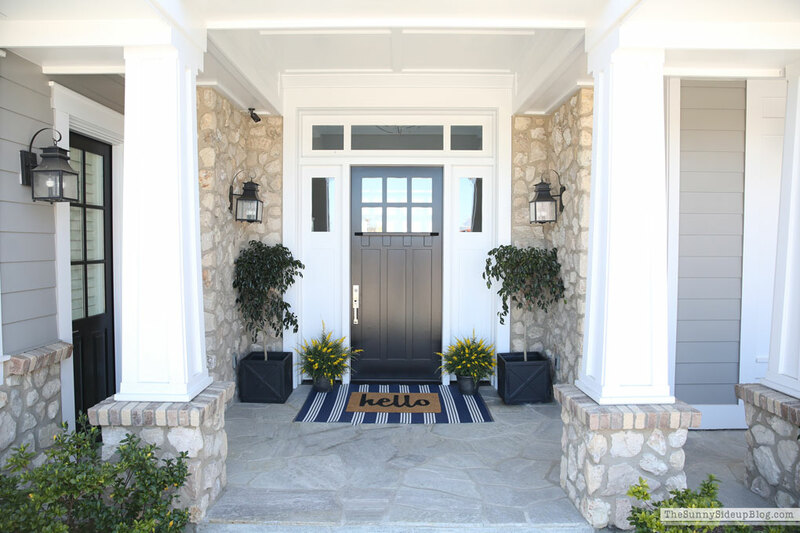 Gorgeous entry! 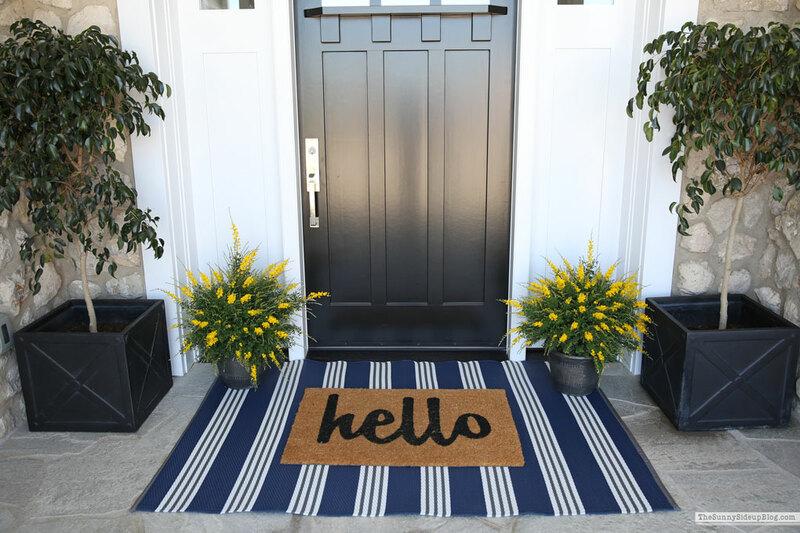 Could you please send me a private email on where you found your HELLO mat. I know you gave suggestions but they don’t excite me. Thanks!